Despite the ever-growing ‘body positivity’ movement, the beauty standards for women everywhere have remained unchallenged. This is especially true on social media platforms such as Facebook or Instagram where perfectly sculpted physiques get the most likes. For this reason alone, postpartum weight loss is, one could say, mandatory. Getting your body back after birth in a timely fashion is something that is constantly reinforced on us thanks to celebrity moms that flaunt their postpartum weight loss stories across all the social media platforms and various talk shows for the entire world to see. This adds a lot of pressure on normal, non-celebrity mommies to snap back to their pre-pregnancy silhouette. Naturally, this created an entire industry dedicated to weight loss for new mothers who want to shed the extra pounds immediately after childbirth. While the industry is booming, new mothers should stop and reconsider what they have been through. After 9 long, oftentimes challenging months you have finally given birth to a human being. For nine months, your body has grown and nurtured another being. This meant extreme hormonal and metabolic changes, as well as higher caloric intake. It’s only natural to have gained some weight. New mommies should re-think how they position themselves against this postpartum weight loss craze and proceed ahead slowly. Your first priority should be a full recovery from the event of birth, which is already in and of itself stressful. Instead of putting extra pressure on your body to lose weight immediately after birth, we kindly advise you to move forward at a slower pace. We’re talking baby steps. Take your time before going on a diet or jumping back into your old workout routine. Then, consult your doctor before starting to shed the extra pounds, as you want to do this gently and responsibly. Jumping back into your old life is something a lot of mothers look forward to. The shift from being pregnant and sharing your body with another human being to not being pregnant can take its toll on your body and mind. 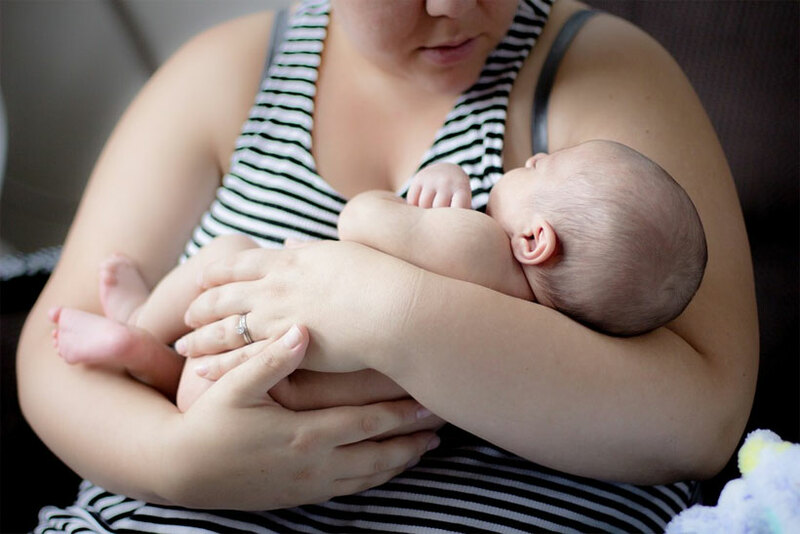 For some new mommies, this phase can be a struggle as they learn to share their lives, and partially their body via breastfeeding, with their babies. Nevertheless, this struggle is completely normal. The best thing you can do at this point is to take things slowly as you and your baby learn to accommodate one another. As far as losing the extra baby weight, it’s important to keep in mind that your pregnancy took 9 months to develop, and it can take just as much – if not more- for your body to return to its previous weight. As soon as your mind is set and clear about the new situation you can start working on what you eat. Instead of starving yourself, which can throw you into a crippling depression, focus on eating healthy. Consume nutrient-rich foods and hydrate yourself accordingly if you breastfeed. Remember, healthy foods produce healthy milk. And you want what’s best for your baby. Factually, as soon as you’ve given birth, i.e. the child has been expulsed, your body loses mass. This means that after giving birth, you will lose approximately 13 pounds (almost 6 kilograms). This sudden weight loss is due to a combination of factors: the actual weight of the baby that is no longer inside your womb, the amount of amniotic fluid you lose when your water breaks, and the placenta. However, the automatic and effortless postpartum weight loss doesn’t stop there. Within the next few weeks, you will continue to lose weight as you shed water weight. Unfortunately, any additional weight in the form of fat will stay put. This means you will have to lose it through a combination of diet and exercise. The most important thing you need to understand is that sugar affects postpartum weight loss like nothing else, not even your hormones! So stay away from foods that contain added sugar and the excess baby weight will start to come off. As a general timeline, most mommies manage to return to their original weight within 6 to 12 months after childbirth. Still, if the idea of dieting and working out isn’t compatible with your lifestyle, then you will be pleased to learn that the odds are in your favor. Statistically speaking, you might be among the numerous lucky mothers who return to their previous body weight simply by reverting to their pre-pregnancy eating habits! Take things slowly. We cannot stress this enough. After 9 months of pregnancy and all the lifestyle changes that come with having a baby, you need to manage your stress levels and set reasonable expectations for your postnatal weight loss journey. Jump back into your old workout routine. If you were an active person before the pregnancy, bouncing back to your previous lifestyle will be much easier. As soon as the doctor gives you the green light for physical activities, hop back on that yoga mat or in that gym. Baby workouts. As the name suggests, these are adorable and effective. Take your baby along for a stroll in the park or hold your baby securely in your arms while doing squats or lunges. Breastfeed. Most mothers opt out of this practice. If you want to burn up to 700 calories per day, consider breastfeeding. It will do wonders for your baby’s health and your weight loss. While keeping in mind that your body is still recovering from childbirth, avoiding high-intensity workouts or demanding workouts is the way to go. Also, only engage in physical exercise if the doctor has given you the green light. Start off in a wide squat (holding your legs wide apart) and hold your hands out in front of your chest. While you straighten your legs, lift your arms overhead while twisting your body to the right. Keep in mind that while you rotate, you should keep your right foot firmly grounded while lifting your left heel. Then, return to the initial position and repeat on the other side. Spread your yoga mat and lay on your side, feet stacked on top of each other. Next, using your free hand, lift your legs keeping your hips and torso on the ground. Repeat 10 times, then switch sides. Get in a classic plank position and try to maintain it for 30 seconds. Make sure your spine is straight and that you pull your abs in. If you can’t manage half a minute from the start, don’t beat yourself up! If you can keep the plank for 10 seconds, take a short break and repeat at least twice. You’ll reach 30 seconds and then 1 minute soon enough. This one targets your abs. Lay on your back with knees bent and your feet touching the ground. Rest your hands wherever you want. Take a deep breath in and exhale as you draw your pelvic bone up. Inhale again to release and exhale to repeat. Keep your back on the ground the whole time. As you can see, postpartum weight loss is NOT “mission impossible”, but you will need to stay focused, and even if you didn’t maintain your body during pregnancy, the results will show before you know it. Avoid anything with added sugar and try to stick to a basic workout routine, such as the one above. Most importantly, however, enjoy the presence of your baby, laugh and love like there’s no tomorrow!